Found in FNA Volume 9. Treatment on page 316. Mentioned on page 313, 314. Herbs, 4–10 dm. Roots: tubers fusiform. Stems with glistening stipitate-glandular hairs and hirsute (hairs stiff, sparse to scattered, erect, 1–2 mm). 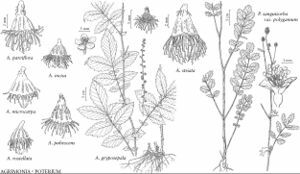 Leaves: mid cauline stipules ± falcate to ± 1/2-ovate, margins often deeply incised; major leaflets 3–11 (mid cauline 5–7), minor 0–1(–2) pairs; major leaflet blades obovate to broadly elliptic to elliptic, terminal largest, largest of these 3.4–10.5 × 1.7–5.6 cm, margins serrate, apex acute to obtuse, abaxial surface glistening with sessile-glandular hairs (often shining) and hirsute (hairs sparse to scattered, 1 mm). Inflorescences: axes glistening with sessile-glandular hairs and ± ascending-hirsute (hairs stiff, sparse to scattered, 0.5–1 mm). Flowers ± alternate. Fruiting hypanthia hemispheric, 1–3.1 × 1.8–3.9 mm, obscurely sulcate, hooked bristles in 2–3 circumferential rows, proximal row spreading to ± 90°, usually glistening with sessile-glandular hairs. Ala., Ark., Conn., Del., D.C., Fla., Ga., Ill., Ind., Kans., Ky., La., Md., Mich., Miss., Mo., N.J., N.Y., N.C., Ohio, Okla., Pa., S.C., Tenn., Tex., Va., W.Va., Wis.